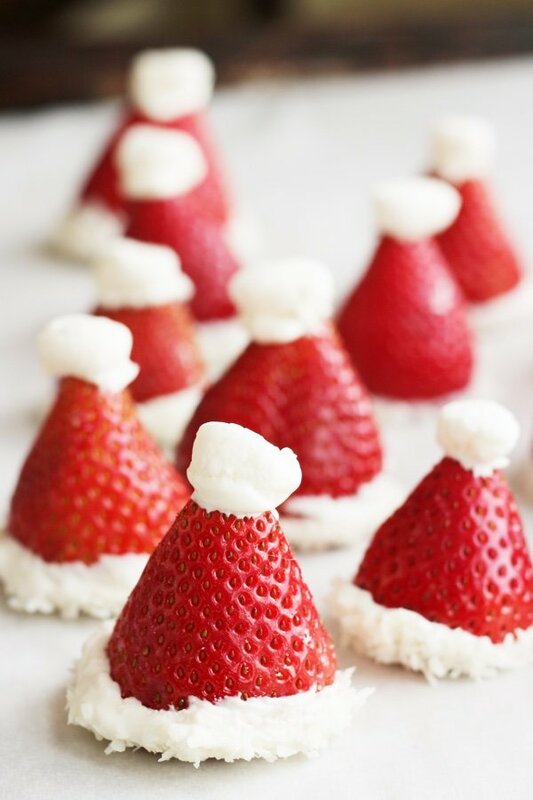 You can’t get any more easy and fun than strawberry Santa hats. First of all – no baking. If you are like me, you are sick of baking after the first 2 dozen cookies so these come as a relief. Secondly, these are far healthier than your regular cookie – makng them both fun and subversive – that is my kind of holiday treat! 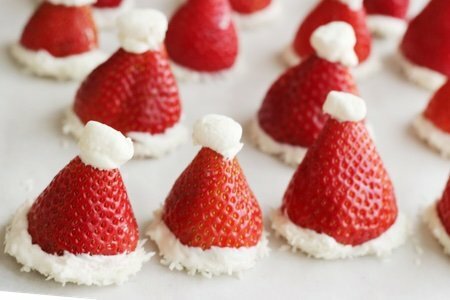 I have done santa hats with ricotta and hats with santa hat with whipped cream but both of those versions had issues. This, my faithful followers, is my favorite version thus far (though, DO check back next year). Melt your chocolate at 20 second intervals at half power in your microwave. 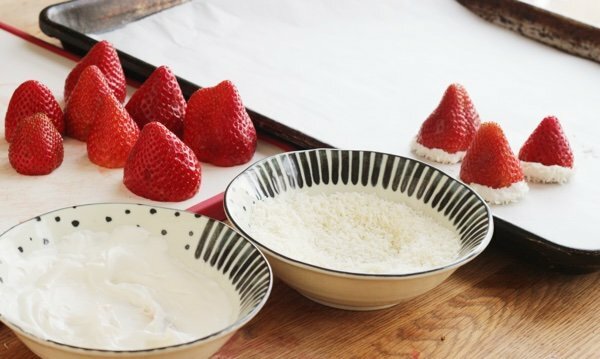 Slice off the green leaves of the strawberry and dip the flat section into the chocolate and then the coconut. Place on a sheet of parchment paper or a non-stick surface. Slice your marshmallows in half with a paring knife (or else they look too big) and dip them in the chocolate and put them on the tip of the strawberry. Voila! Serve these at a brunch or for dessert. I love to make these with the Christmas cookies so that I encourage my children to eat some fruit. This works! They also look really pretty a cake as a decoration or around the base of the cake. You cut cut them in half and stick them on the side of a cake – no? I found unsweetened coconut in my baking aisle but you may have to go to the Natural Foods section or a specialty store such as Whole Foods. I don’t know why it is so hard to find because it tastes AMAZING without sugar. The sugar in the chocolate is enough to sweeten the whole confection. Line a baking sheet with parchment paper. Slice the hull off the strawberry to make a flat base. Heat the white chocolate in the microwave at half power for 20 seconds until melted in a small bowl. Place coconut in a small bowl and dip the flat end of the strawberry, first in the chocolate, then the coconut. Place on the baking sheet. Repeat. 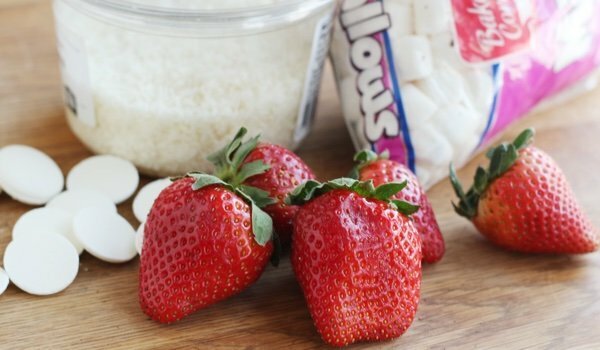 Dip the half of marshmallow in the chocolate and place on the tip of the strawberry. Place in fridge for 10 minutes and enjoy. Can be made 1 day ahead. I've got a staff bring a dish lunch on Wednesday and I am definitely going to try and make them. I am such a rubbish baker so something like this is right up my street. I like the way your Santa Hats are evolving each year! These look easier, more stable and I like the white chocolate glue for the yummy coconut! Very cute addition to a cookie tray! I keep a jar of unsweetened coconut for adding to things like cookies, muffins, ice cream, etc. Thanks for your update. I have found the unsweetened coconut in the FREEZER section at my local WalMart. Go figure! Just thought I'd share that in case it helps anyone else hunt it down. I guess it doesn't sell very well or maybe it's popular for smoothies, so they put it there to be near the frozen fruit? If I remember right, I think someone working in the freezer section had to help me find it. Cheers! Wonderful! I meant to make these last year, but will definitely add them to my repertoire this year! Thanks Lisa! It's a perfect kind of holiday treat!